It is a counterfeit, thought to have originated in New Jersey. The counterfeiter evidently prepared his mold from coins of two different dates, using the reverse of a prewar nickel struck at the Philadelphia Mint, thus producing a passable copy of a nonexistent coin. Wartime nickels, dated 1942-1945, consist of 2 types, Type 1 and Type 2. This is because the federal government decided to change the composition, as nickel was needed in the war effort. The first type, Type 1, were minted through the first part of 1942, and look the same as earlier nickels, and having the same metal composition, the intrinsic value is nil. There is NO mintmark above Monticello on the reverse of Type 1 wartime nickels. 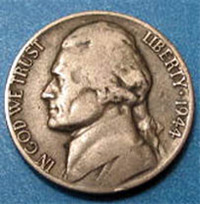 Type 2 wartime nickels were minted beginning in the 2nd part of 1942, and continued through the end of 1945. These contain 35% silver, and NO nickel at all. Type 2 wartime nickels have an intrinsic value based on the current silver price, so even worn examples will be worth approximately 90 cents when silver spot is around $17. To tell the difference, you must look at the reverse. An oversized mintmark will appear above Monticello on the Type 2 35% silver pieces. The mintmark appearing above Monticello on Type 2 Wartime Nickels can be a “P” (Philadelphia), “D” (Denver), or “S” (San Francisco). This was the first time that the P mintmark was ever used on a coin. Previously, the absence of a mintmark identified a coin as having been minted in Philadelphia. The P and D mintmarks were used in 1942, 1943 and 1944, while P, D and S were used in 1945. Your 1944 nickel is a “Contemporary Counterfeit”, sometimes called a “Circulating Counterfeit”. These were made by unscrupulous individuals to circulate “Contemporaneously” alongside of genuine pieces as current money. These were NOT made to fool collectors, and are NOT the modern copies we have unfortunately seen become so prevalent in this great hobby. Although there may have been others, the most famous counterfeit wartime nickels were made by Francis LeRoy Henning in New Jersey. He was caught when he used an earlier reverse to counterfeit 1944 nickels, so no large mintmark is found over Monticello! There is a very dedicated group of collectors for these, and other old forgeries, and the price of Henning Nickels has varied over the years, with current pricing being around $75, but we have seen them sell for between $60 to $100+.